Alfred Abel has a long and impressive background in classical music. 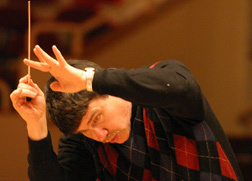 Perhaps it’s his work with the Wabash College Chamber Orchestra that, while not as high-profile, is the most gratifying. The orchestra, comprised of Wabash students, faculty and community members, will perform their fall concert 7 p.m. Sunday in Salter Concert Hall in the Fine Arts Center. Under Abel’s direction, the group will perform Ludwig van Beethoven’s "Symphony No. 1 in C Major"; Edvard Grieg’s "Peer Gynt Suite No. 1" (Morning Mood, Ase’s Death, Anitra’s Dance, In the Hall of the Mountain King); and John Corigliano’s "Elegy for Orchestra." The event is free and open to the public. With two undergraduate degrees in classics and violin performance and graduate studies from Indiana University, Abel has been concertmaster of the Lafayette Symphony Orchestra since 1986 and a member of the Indianapolis Chamber Orchestra since its founding in 1985. It was five years ago when the Trio Amabile — in which he plays violin, his wife Colette plays viola and Margot Marlatt plays cello — performed at Wabash College. Afterwards the chairman of the music department asked him if he would teach violin and viola as an adjunct professor. After one year of that, Abel was asked to conduct the college’s orchestra. Having experience leading two Indianapolis youth symphonies and the Lafayette-based Wabash Valley Youth Symphony, he accepted the offer. "When I first came to conduct the orchestra, it was a relatively small group that wasn’t doing much in the years immediately preceding my coming on," Abel said. "I think they played one concert a year. Because the numbers were small, the type of repertoire they could play was very limited. I think it was also somewhat helpful that I played violin and viola because there are far more violins in an orchestra than any other single instrument." 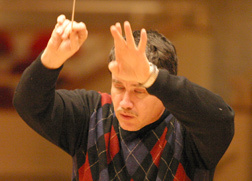 By Abel’s second year instructing the orchestra, the program started performing one concert per semester. The music itself also has become more sophisticated. "In the years I’ve been there, the group has grown in size and quality, and accordingly the type of music we’re able to play has also gotten more interesting and difficult," Abel said, citing Beethoven’s first symphony as something that "would’ve been a huge step up a year ago, but I think the group is actually very ready to handle that now." It helps that there’s community involvement in the orchestra. Abel estimates there are between six and 10 citizens regularly involved with the program. "We have some people who’ve been coming for years and years," Abel said. "I’m very happy to have them. I think it’s nice for them to interact with the young men from the college, and I think the guys from the college enjoy working with the community members as well. And we couldn’t do it without them." The Wabash Chamber Orchestra may not be Abel’s most financially rewarding job, or the most prestigious. But he’s found the relationship fulfilling in other ways. "I like to see things grow; I’m a gardener," Abel said. "I’m much more interested in the process of growth than I am with ready-made blooms. To see a group like the Wabash Chamber Orchestra grow and improve gives me a lot of satisfaction. I also think it’s an essential part of training for the students there that I teach, that they have a quality orchestra experience. I feel the whole Wabash music program, in some ways, benefits if there’s a strong orchestra program to serve as sort of a magnet to attract students from around the country to come." Dan Gillespie, a sophomore violin player in the orchestra, finds Abel’s direction worthwhile. 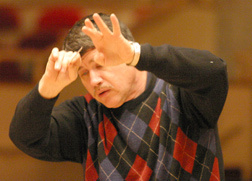 "He really connects with the students and cares about this orchestra," Gillespie said. "He puts forth a lot of challenges for us, but at the same time it makes us want to try harder." As long as the symbiotic relationship between Abel and Wabash College remains copacetic, he has no plans to leave the program he’s done so much to improve. "It hasn’t grown old for me yet," Abel said. "I feel the experience so far has been a mutually agreeable one. I’ve learned and been able to grow as a musician by doing this. I think the orchestra itself has improved a lot since I’ve been there." Wade Coggeshall covers the Wabash College beat for the Journal Review.